I haven’t wheeled my bike across Stellenbosch High School sports field to ride Die Burger in a while. It’s not even called that any more – the familiar name, now replaced with one embodying all the creativity of double entry bookkeeping. Accurate, but dull. I vaguely recall reading somewhere the entry limit was 7,000 riders, but numbers dotted around the field and gathering in chutes felt way less. I doubt the name change had any role in that – more likely the prices which seem to steadily increase with every season’s events. For my part though, none of that mattered. 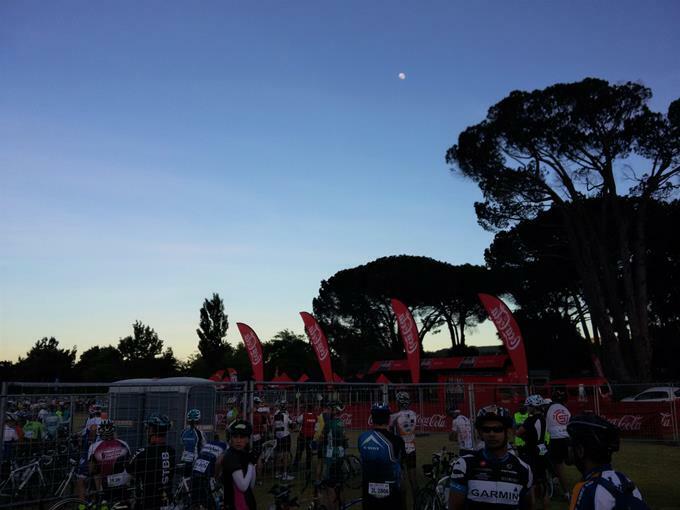 It was still the same great route around the heart of the Cape Winelands, and I was looking forward to some proper hard racing again – a chance to ride fast instead of conserving energy to ride far. Plus a bonus of the small start groups was an unusually relaxed atmosphere as we waited to shuffle forward across the temporary bridge and roll to the start line. I felt decidedly more relaxed than usual too. Somewhere out on those long Audax roads I must have lost my pre-race nerves. I hadn’t arrived stupidly early and stood around for hours winding myself up. Instead, I’d taken the advice of my sports masseuse (Andre Brand) and gone for short a warm-up spin towards Jonkershoek gate, arriving in the chute less than twenty minutes before my start slot. It was a rather refreshing change. As it turned out, I took the relaxation a stage too far and wasn’t paying attention as my group (2L) reached the start line. I was still fiddling with my Garmin to reset the warm-up data as the start gun fired. I looked up to see 40 or more riders disappearing around the first right-hander heading for Helshoogte pass. Rookie mistake number one – my wheels were still coming up to speed, and I’d already been dropped by a little less than half of my group. At least my legs were already loosened up so I attacked the climb and began the task of hauling as many of them back as possible. I was blowing hard by the top. I’d passed a couple of 2L numbers on the way up, but it was all rather fragmented – I needed a proper bunch to get the days activities underway. A familiar pattern began to unfold around me. Slowly small groups of riders started to coalesce as we charged down through Pniel. By the time we hit the long smooth straight leading out to the ninety degree turn in front of Allée Bleue a nicely sized group had formed. I was still riding like a rookie though – sitting way too far back, in that uncomfortable concertina of almost getting dropped and then having to chase myself back in. I started to work my way towards the front third. We were travelling fast though, and the treacherous railway lines coming up ahead demanded my immediate attention. Last time I’d raced this stretch was with Hendrik, and our bunch had gone down at the front in a nasty pile as they crossed those lines. We’d been far enough placed to the outside to avoid the trouble, and I slid myself out to a similar position in readiness. It was a relief to see the organizers had got mats down covering the gaps, but the relief didn’t last long. There may not have been gaps to catch a wheel but the bumps had dislodged a bottle from a rider somewhere left of me. It’s arcing flight ended on the road in front, after which it bounced and rolled into my path. I stomped down to accelerate past it but my chain slipped, the gears must also have skipped with the jolt across the line. No power, and no room to swerve – if I didn’t do something quickly I was going down, along with a bunch of annoyed riders around me. Survival instinct took over and I bunny hopped. It’s not a great skill of mine, but I got just enough air to clear the damn thing. Phew, now my heart rate was properly warmed up to race tempo. Our bunch flew along the road past Drakenstein Prison heading towards Paarl. It’s one of the faster stretches of the ride, but with gentle terrain too – so it’s a good place to settle the nerves, work into a good place in the group, and recover a bit after the early exertions over the pass. I spotted a club mate, Sasha, somewhere along here, and we chatted a while as we sped along. The legs felt strong, but I still had the sense of riding like a complete beginner. I needed to get my act together and tame this intense, surging beast which was all around me. It was unnerving to see a downed rider being tended to in the middle of the road along this stretch. He looked in a bad way, and a friend commented later he thought there’d been a crash with an oncoming car. It didn’t seem to deter riders around me, many were still veering over the white line – playing chicken with cars just to gain a few more places. I bided my time, and waited for natural gaps to open up without taken such risks. Eventually I worked my way forward until there were four or five riders ahead of me, held my line, and focused hard on holding that perfect distance from the wheels in front. Typically, in past year’s, I’ve lost my group where the route swings right off the Drakenstein road and heads in towards the Du Toits junction. 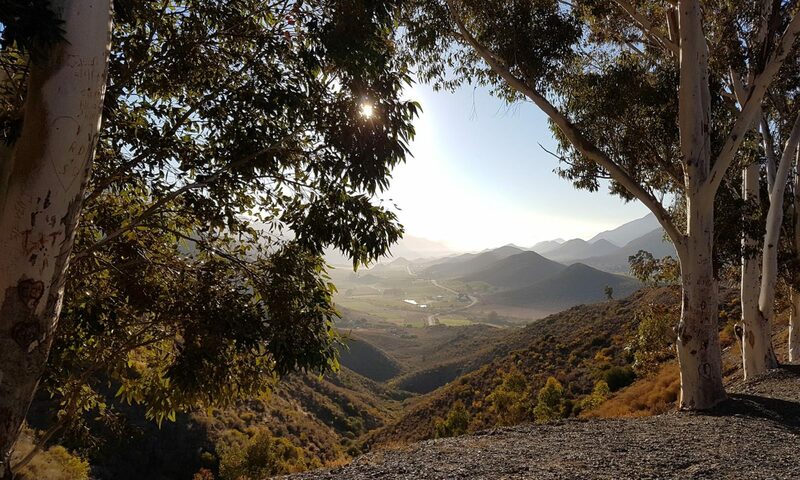 Not this time though – I’d recovered enough from the fast start, and had no problem sticking with the bunch as Sonstraal road looped around, up and over the short sharp ramp, and then raced down towards Paarl. The road surface though was a different story. Travelling upwards of 50km/h, the bike kicked around like a mule – some of the dips in the tarmac were almost enough to throw me off track completely. I managed to keep a bit of a safety gap around me, but it was a scary few minutes. Or words roughly similar to those came from an A group rider who’d been in or around our bunch since Boschendal. Turned out he’d flatted early on, and dropped back to ride with a friend after fixing his wheel. I forget his exact machine, but it was a pretty swanky carbon thoroughbred, which I also commented on. His reply was that it was stiff as heck though, and I was probably enjoying a much more comfortable ride than him. He wasn’t wrong. One thing the Burls certainly excels at is comfort – and it was most welcome today. I smiled also though. Stripped of mudguards and bags, and fitted with lighter wheels, she wasn’t doing a bad job at keeping up with the racers either. It would have been nice if the Giant TCR had been ready to race, but it was also great to give the Ti beast a proper blast too. Rookie mistake number three came as we made our way out towards Wellington. Two riders broke off the front of our bunch and for some reason I chased after them. It made no sense at all and nothing was gained. Within a couple of kilometres I was back in the same bunch having achieved nothing more than wasting some energy for no result. Just up ahead was Windmeul winery, a welcome sight signalling the end of the haul up out of Wellington. It was also, as is often the case, where the wind started to kick in. Although it only lasted for maybe the next 10 or 15km, it was strong enough to splinter our bunch. In a lapse of concentration, I missed the split, and that was it for me – my group riding for this Die Burger was done, the rest of the work home was down to me. I pushed my arms far out forward over the top of the hoods, dropped my head and elbows, and began to crank out a steady, solo time trial pace. Hampered at first by the wind, but approaching Klapmuts it died off and I began to make better headway and pick up some decent speed. Woops, I’d been head down and so focused on grinding out my pace that I had ridden right past Theunis without even noticing him. I sat up, backed off, apologised, and we chatted a while. He’d blown up on the stretch from Wellington and was now battling. I felt for him. That exact same stretch had been my nemesis in many previous years. Whenever my preparation hadn’t been quite where I wanted it, that’s where it caught up with me. There was nothing I could do, but it’s always hard riding away from a good friend, even when they’ve told you not to hang back for them. I rode on past the last water stop. My bottles were nearing empty, but with 18km to go I wasn’t about to stop and waste time. Somewhere along the Drakenstein road a lad of maybe 12 or 13 had been hanging in our bunch, and I saw him again as the road pitched upwards past Wiesenhof. It was an impressive piece of riding for such a youngster, especially on a bike that looked way too big for him – perhaps borrowed from dad or a big brother. Either way, a definite cycling talent in the making. I was still kicking myself for losing my group, but over the top the terrain was easy now and I could crank out a nice fast solo. At some point I looked around and saw a sight which made me smile. I might have lost my bunch, but a bunch behind had not lost me. I’ve no idea how long they’d been there, but I was towing a group of maybe 10 or 15 riders. One of them even thanked me for the pull as we bunched up over the final short incline before home. I pushed hard into the outskirts of town, the Garmin reading a pleasingly fast pace. I took a nice wide swoop at the last left turn by the robot back onto the R310 – leaning low into the corner and carrying as much speed as possible into the short ramp after the turn. I stood up and thumped hard on the pedals. I was well short of a sub-3, but I knew that was never really very likely. Ender 3:15 though would be a great result for my first proper race in a long while, and I wasn’t going to let that slide away. According to the Garmin I just made it – which the official race time published later confirmed – 3:14:46. Considerably faster than I’d expected, and better still I’d made 20th out of 110 in my start group. Despite a number of rookie mistakes, I’d managed to catch about half of the riders who’d got away ahead of me at the start.